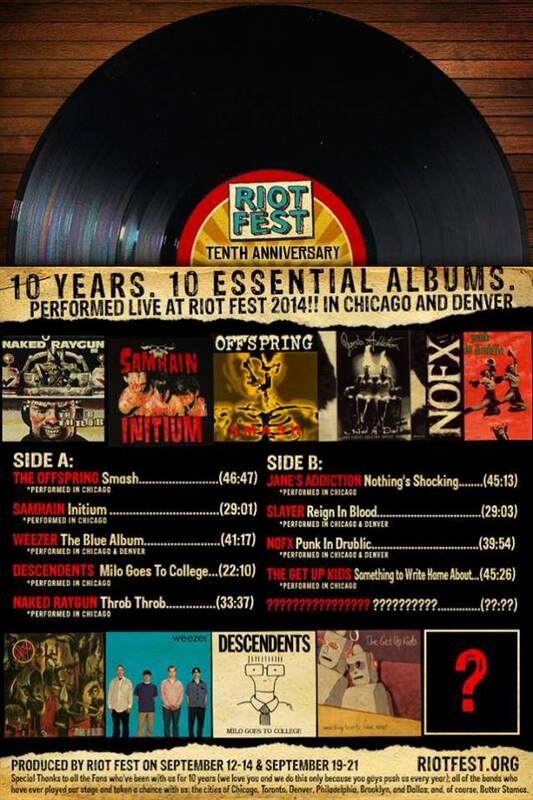 According to RollingStone.com, SLAYER, JANE'S ADDICTION, THE OFFSPRING and SAMHAIN are among the bands who will be playing albums from their respective catalogs in full at the Chicago edition of Riot Fest this summer. The albums that their respective bands will be revisiting in Chicago this year include SLAYER's "Reign In Blood", JANE'S ADDICTION's "Nothing's Shocking", the Glenn Danzig–fronted group SAMHAIN's "Initium" and THE OFFSPRING's "Smash". SLAYER will also perform "Reign In Blood" front to back at the Denver offshoot. Now in its 10th year, Riot Fest will once again take place in three cities at different times this year, each with a unique circus-style theme. Toronto's Riot Fest & Expo will take place on September 6-7 at Downsview Park, Chicago's Riot Fest & Carnival will happen September 12-14 in Humboldt Park and Denver's Riot Fest & Sideshow is slated for September 19–21 at May Farms. The Chicago edition of the festival will be the first time GWAR perform since the death of frontman Dave Brockie, who played the character Oderus Urungus.